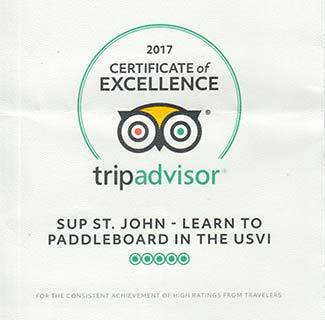 Paddleboard Rental St. John: SUPs for Family Fun. 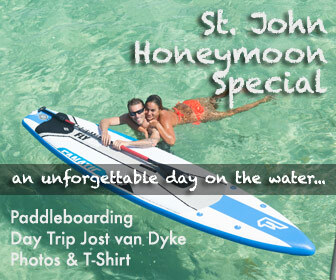 We have a wide variety of Paddleboards for Rental on St. John in the USVI. 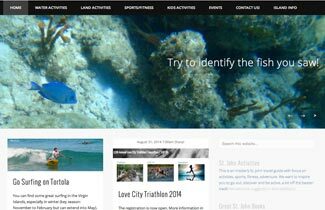 In this article we are explaining the models that are great for beginners and family fun. SUP ATX Adventure XXL 12′ – floats up to 450lbs (!) super thick and stable you can fit your whole family on it! Kids from 5-6 years onwards can usually paddle on their own in calm bays like Maho. You can find our boards for kids and teenagers here. This board is super wide, thick and stable but has no rubber deck which makes it a bit lighter. We have attached a luggage net to it, so you can take a dry bag or snorkeling gear. The 11.6 is suited for medium to heavy riders. If you are average build, you can easily take a kid or even kid and wife on the board. If you sometimes paddle on your knees for longer periods you want to take one with a deck pad. 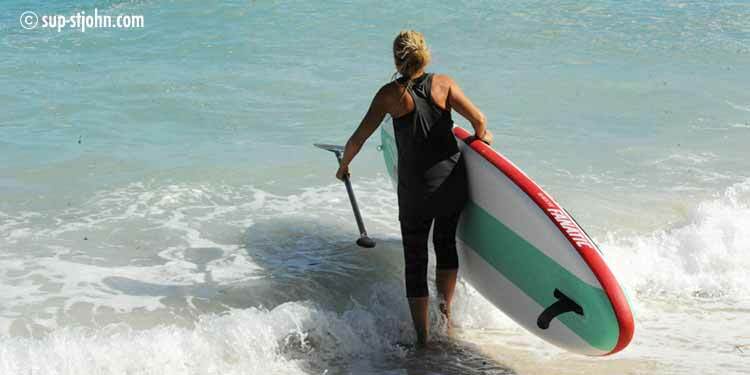 The Fly Air Fit was designed as a Yoga Board. It is so wide and thick that you can actually do Yoga Exercises on it, but it also is a great board for beginners and familiy fun since it is so stable. 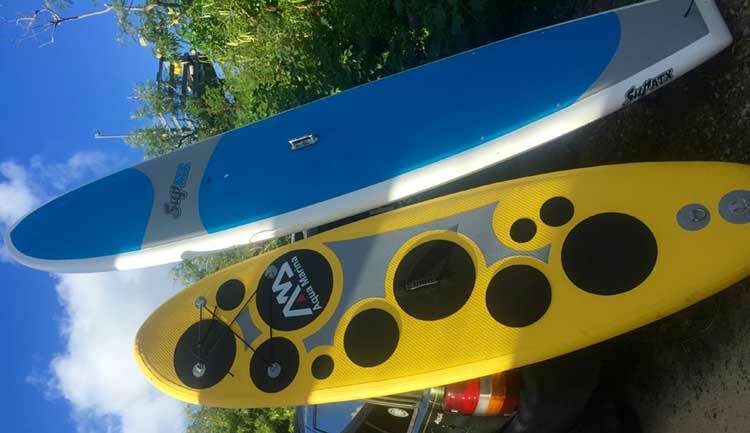 It is an inflatable board, so it will not break when you drop it or hit rocks with it, it is super light and easy to carry and you can just throw in on the car roof without any soft racks. Should you wish to take it for a hike e.g. to Salt Pond, you can also uninflate it and carry it in a backpack. We have only 2 boards of this model so early reservation is recommended. 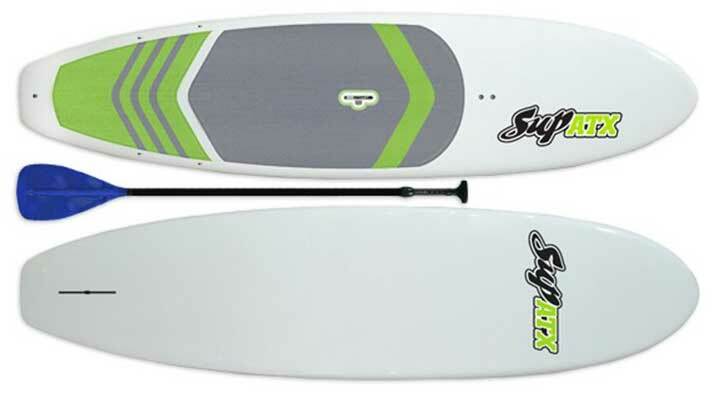 When you rent one of our Family SUPs you will get free additional life vest for your kids and a free Fanatic Kids SUP Paddle. 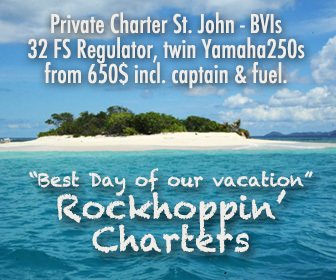 Leash, Life Vest, Soft Racks as well as delivery and pickup are included in the price anyways.